Unter Null - ZineWiki - the history and culture of zines, independent media and the small press. Unter Null (german for Less than Zero) is a comic zine published in Cologne, Germany. The publication started as a collaboration between homeless people. The zine was meant to be a platform for communication and a self-help project. First Issue (#0) was self–published 1995 and was sponsored by Carpe Diem e.V. Starting with issue #1 Unter Null was self–published and financed by the collective. Contributions by Apollo, Hiu-Hiu, Fliege, Florian, Gemmel and Sochlez & Schulze (aka Oliver Scheibler). Format of the first issues was A4. Distributors to #2 are Gemmel, Jonas, Hiu Hiu, Onkel '87, Jo Zimmermann, Ulevir Sochlez and Fliege. The latest issues were published and produced in 2015 by Morgän and Oliver Scheibler with contributions by Torben Röse and Patrick Rieve. 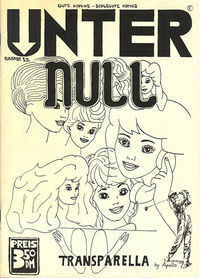 Issues of Unter Null are included in the collection of the St. Patrick's Zine Library. This page was last modified on 27 December 2015, at 06:24.